Harold has 16 years of Martial Arts experience, possessing a third degree in Jui Jitsu Kai, 3rd degree in Goju Kai and a second degree in Chito-Ryu. Harold captured the Canadian Heavy Weight Championship three times in 1982, 1983 and 1984. Harold was the World Heavy Weight Jui Jitsu Champion in 1983 and 1985 and was a member of the Canadian National team in 1986 and 1987. 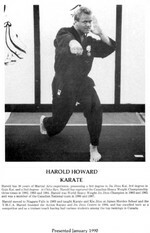 Harold moved to Niagara Falls in 1983 and taught Karate and Kiu Jitsu at James Morden School and the YMCA. Harold opened his Action Karate and Jui Jitsu Centre in 1984 and has excelled both as a competitor and as a trainer/coach having various students among the top rankings in Canada.